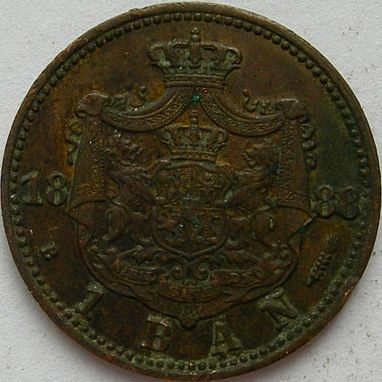 denomination "1 BAN", year 1888, Romanian coat of arms, letter B and wheat ear, the signs of Romanian mint, outer pearl circle inscription "CAROL I REGE AL ROMANIEI" meaning "KING OF ROMANIA" and CAROL I head facing left, outer pearl circle. Under the neck lies KULLRICH, the engraver's name. The 1 ban 1888 coin pictures above are present on Romanian coins through the kind permission of an anonymous donor. The coin was sold for over 900 euros on Ebay in May 2012. The mintage figures for this coin is 500 pieces, after monograph Monede şi bancnote româneşti (Romanian Coins and Banknotes, Buzdugan G., Luchian O., Oprescu C., Sport-Turism Publishing House, Bucharest, 1977). Monetele României (Coins of Romania, Iliescu O., Radovici P., Encyclopaedic Printing House, Bucharest, 2004) consider that these pieces are only tokens, and the mintage is unknown. The 1 ban 1888 pieces were distributed at several balls organized by the Royal House of Romania, in fund raising actions for charity. Such 1 ban coin could be obtained for 20 lei. One variant was reported: gilded 1 ban 1888. Of course, 1 ban 1888 can be considered to be a coin - a special one -, and not only because it was struck at State Mint of Romania. The case of this piece is resembling the one of the contemporary anniversary coins that are sold by the National Bank of Romania at prices much higher than the face value (even 50 - 100 times), and never enter into actual monetary circulation (in spite of the fact that, in theory, they can be used in payments).